By Wesley Fenlon on July 10, 2013 at 2 p.m.
Cheap airline tickets, complex equations, and endless baseball statistics are not the domain of Google's far-reaching search juggernaut. On July 8, Yahoo! shut down 18-year-old search engine AltaVista. Its servers were switched off, its algorithms silenced, its web crawlers laid to rest. Back in 1997, a year before Google first appeared online, AltaVista raked in two million hits per day. AltaVista was one of the most successful search engines to launch in the mid-90s. That success didn't last long in the age of Google, and AltaVista was purchased by Yahoo! in 2003 and eventually relegated to obscurity. AltaVista's death is a reminder that, pre-Google dominance, there were a ton of search engines with their own quirks, specialties, and varied indexes of the web. Searching one wasn't guaranteed to deliver the same results as the others. The World Wide Web didn't quite feel like a wholly interconnected web, just yet--each search engine or web crawler was a nexus into a unique corner of the Internet. AltaVista also established a precedent of branching out from search that Google would later build upon. Long after it had lost popularity as a search engine, AltaVista's Babel Fish was the go-to online language translator. And while Google now serves as our general purpose search tool, and makes the operating system for millions of smartphones, and runs the most popular email platform on the web, and dominates Internet advertising, there are still those quirky, speciality search engines out there that do things Google Search can't. The World Wide Web is far more interconnected and searchable than ever, but it's also bigger than ever. In AltaVista's honor, we've hunted down some of those search engines that still fill a special niche, gotten advice from some Tested readers and highlighted a few old favorites that once seemed amazing and have now been one-upped by the all-consuming Google. The Wayback Machine: Archive.org's Wayback Machine is the ultimate search tool for things Google can't find--because they no longer exist. According to Archive.org's FAQ, the Wayback Machine hosts more than 350 billion pages, taking up more than two petabytes of storage. Popular websites will often have hundreds of entries archived over years of Wayback crawls, but it's amazing how many obscure Geocities fansites are preserved within the Wayback Machine. Baseball-Reference: There's no sport with a greater emphasis or appreciation for stats than baseball. Baseball is as much about history as it is the current season's games, and players are often famous more for their RBIs or home runs or strikeouts over a dozen seasons than they are for individual game-winning plays. Baseball-Reference.com has made all those records and statistics searchable since 2000. And we mean all the records. Just look at the immense amount of detail on Hank Aaron's page, for example. 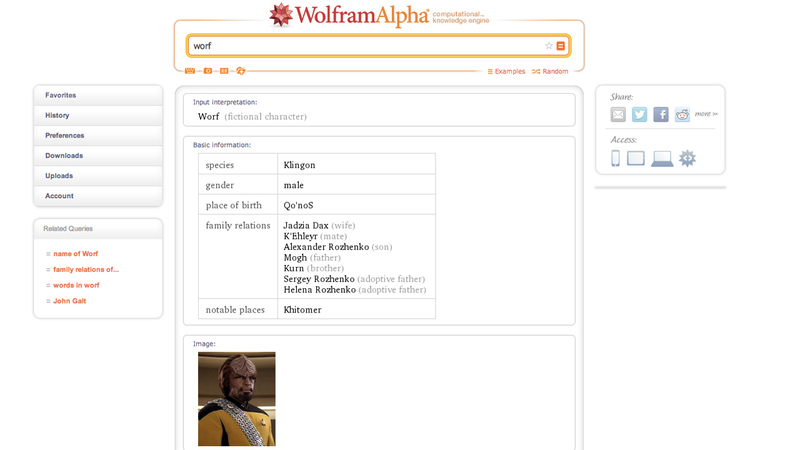 Wolfram Alpha: The "computational knowledge engine" doesn't search the web like Google, but it's definitely smarter--or at least better at math--than our go-to engine. Wolfram Alpha's ability to spit back direct answers to questions still feels a little bit like magic, and it offers a more scientific approach to search results. The results page for Tony Blair, for example, lists notable facts about the British politician, his governmental role, and one physical characteristic. Google has begun to integrate Wolfram Alpha-like results into its search engine by showing similar data for famous people (pulled from Wikipedia), showing weather conditions, and so on. Giphy: Just a few months ago, Google added an option to narrow Image Search results down to "animated," aka GIF search. 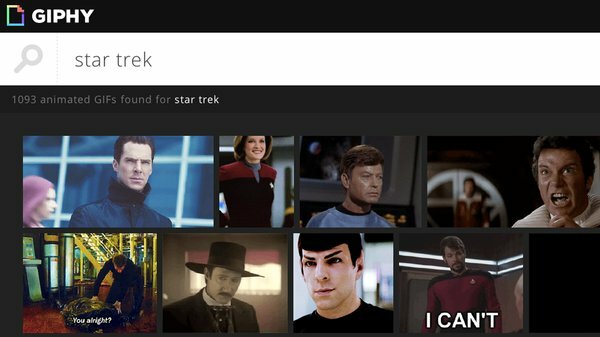 Giphy is a brand new startup that offers its own database of searchable GIFs, and each image is tagged. A search for Metal Gear Solid, for example, brings back the kinds of GIFs you'd expect, but a search for something more general--like the word joy--returns very different results. Memes and more expressive GIFs pop up than in a similar Google search. Giphy also tells you how many frames are in each GIF, which is pretty cool. TinEye: Reverse image search is another tool Google has recently added to its arsenal. But before Google added the ability to search by an existing image, TinEye was an invaluable tool for finding out where a video screencap came from, or to find a larger version of an image, or to track down a mystery artist. TinEye doesn't search by image metadata, but rather through recognition algorithms to identify similar or identical pictures. Also, Google and TinEye present their findings differently. TinEye is extremely focused on its database of 3 billion images, but Google actually uses an image to, first and foremost, return web page results that host a similar image. Creative Commons Search: Here's a simple one. When you search for a photograph on Flickr or Google Images, often the photographer hasn't' given permission for that photo to be used elsewhere online. So you trudge off, sullen, to find something else. With a Creative Commons search, you can set narrow search results for images, music, or other media that's shared under a CC license. Can I Stream It: Just a couple years ago, if a movie or TV show wasn't on Netflix or Hulu, you probably wouldn't plan to stream it online. But those days are past--there are now so many competing popular video delivery services with different movie studio deals that it's hard to keep track of what is available where. Can I Stream It is awesome because it searches all of them--streaming options like Netflix and Amazon Instant and Epix, rental options like iTunes and Vudu, even cable services like HBO and Comcast Xfinity. 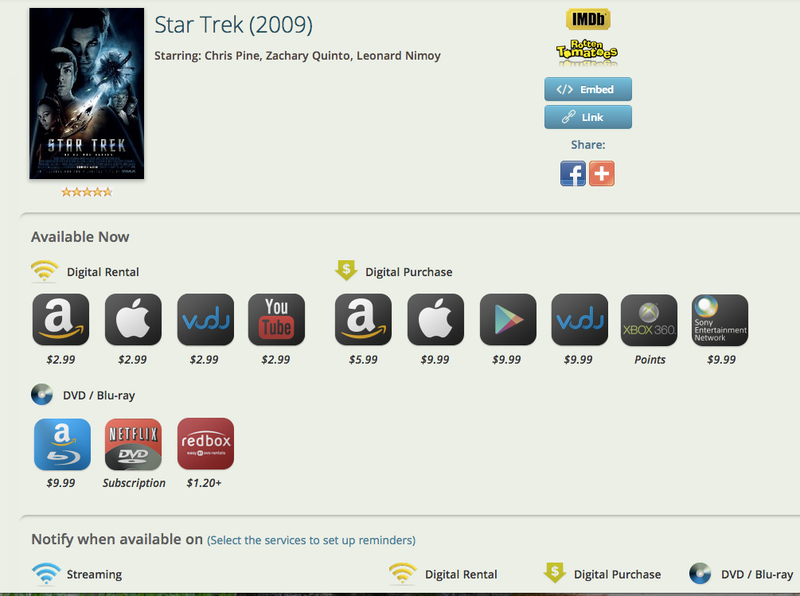 With an account you can also set up notifications to be messaged when a movie becomes available. Duck Duck Go: This search engine made a name for itself in 2012 by promising not to track its users--Google's privacy issues over the past couple years have been one of the unfortunate side effects of its massive web reach. But the engine also highlights a ton of "goodies" or instant feedback tools akin to Wolfram Alpha--doing matematic calculations, generating random passwords, providing instant recipes. Google can do some of those things, but not all of them, and Duck Duck Go offers a very clean, simple interface. Google Flights: This may be one of Google's least-known search acquisitions, but it's a great tool. Back in 2010, Google Purchased ITA Software, which ran the airface search system QPX. Never heard of QPX? You've probably used it--the engine was behind travel sites like Kayak, Orbitz, and CheapTickets. Now that data is fed raw into Google Flights, without the annoyance of a travel site trying to sell you hotel rooms or rental cars alongside your plane tickets. We know including a Google site on the list is cheating, but ITA Software built the technology before Google bought them up--that counts, right? Flightfox: On the subject of airfare searches, Flightfox is a pretty awesome person-driven flight tool. It's not a search engine, exactly, but a pay-for service that draws upon the expertise of frequent flyers and travel agents to net you the best possible deal on airfare. You can go in pre-armed with knowledge about cheap flights and pay a few bucks for the experts to find something cheaper, or describe a desired trip and let them do all the work for you. While paying for Flightfox for short or cheap domestic flights doesn't make much sense, you could potentially save hundreds on major international flights by crowdsourcing the kinds of people who know exactly how to snag the best airfare. Honorable mentions: The Library of Congress' Thomas database, the subscription-based Galileo educational search database, and LexisNexis for legal documents.